What a crazy month it has been! My last post was for last months SRC reveal. Heaven only knows where the whole month went. I can't complain though, its been busy with work as well I have a new project in the pipeline that I am so very excited about. I can't wait to share more about that soon. Stay tuned!!! Today, I'm very excited to share with you the recipe I picked and recreated for the reveal. I was assigned Ilona's Kitchen. I was excited when I learned I was paired with this wonderful blog and on spending some time going through the wonderful recipes here, I wasn't disappointed. Ilona's blog is choc full of yummy recipes. She has a ton of citrus desserts. 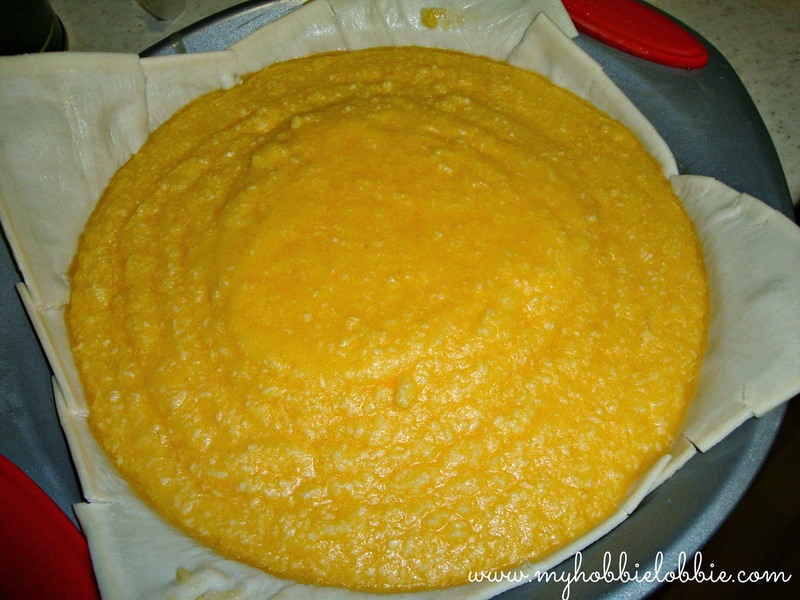 I love citrus desserts and I have a few of her recipes earmarked to make soon. But when I saw her post on a coconut pie, I was sold. I love coconut in all its many forms in chutneys, coconut based curries, in my veggies and of course in the sweet form. If you love a Bounty bar or a Cherry Ripe (minus the cherry, of course), you will love this. This recipe reminded me of a Goan recipe for coconut cake, which I happen to love and will share on this blog soon. I stuck to the recipe but just made one little change, it wasn't a choice, but a little bit of a necessity. You see I thought I had some frozen shortcrust pastry in the freezer, but it turned out I didn't. I did however have some puff pastry and decided to give it a go and see what happened. Oh and I used unsweetened desiccated coconut, because no matter how hard I looked, I couldn't find the sweetened version. With the ingredients on hand, this pie is a dream to put together. It is simple and quick with no fussy process involved. Of course, I could barely wait for this to cool. I didn't get a picture of a cut piece of this pie. But it was so very good. The pastry was flaky and crispy and the filling was just right. Using the unsweetened desiccated coconut worked well and the filling wasn't cloyingly sweet. My husband really liked the pie, but he didn't care for my puff pastry base and I agree. The next time I make this, it will have a homemade shortcrust pastry base. If you'd like to make your pastry from scratch, you can refer to my shortcrust pastry recipe here. Whisk the eggs in a large bowl till frothy. Add the melted butter and stir to incorporate. Add the vanilla and vinegar and stir well. Add the coconut and stir till well incorporated. Place the pastry in a pie dish and pour the filling in the unbaked pie base. 2) Also, I think I've let this bake for a couple of minutes more than I should have, so it looks darker than golden brown. We tend to like our pastry a tiny bit over. Feel free to take the pie out of the oven when you are satisfied with the color. Never would have thought to use puff pastry to replace a missing crust - very creative! I also love coconut in all its forms and now trying to figure out where I can get a Cherry Ripe. Creative yeah, but my husband wasn't convinced. I think I'll stick to my good old shortcrust pastry from now on. Yum yum...this looks so good!! I've never had coconut pie before. Sounds delicious. i love coconut! this sounds great. it was so much fun to have your blog this month! YUM! Great summer flavors before summer is officially over! Thanks Leigh ... how was your recent holiday? 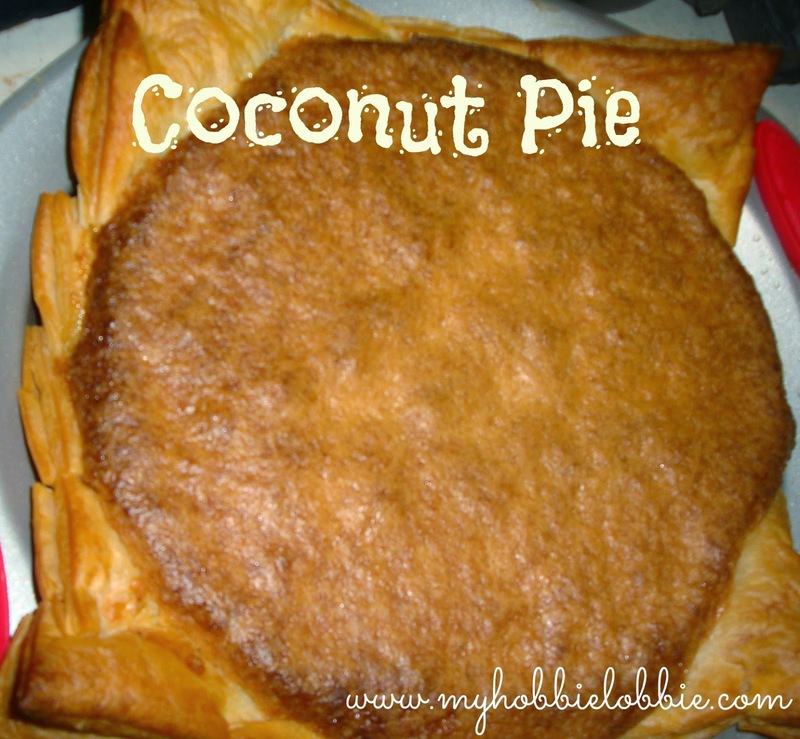 I'm allergic to coconut, so sadly, all I can do is look at this pie and not taste it, but I bet it was delicious!